I mentioned briefly about not having a kitchen back in August and well that is still true in some respects, things are starting to come along. Paul's grueling work schedule during our move came to a final stop so we have been able to get things going in a serious reno direction. I didn't think ahead of time about taking pictures of the room before we started any work so I'll have to rely on the realtor's photo (below) from the website. 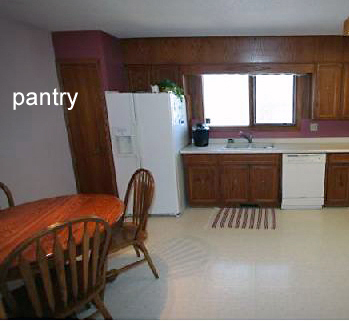 Can you see the old kitchen pantry door that is dark brown and off to the left of the fridge? That was the original pantry door when we moved in. A narrow door about 1 1/2 feet wide that you would have to enter sideways to get into. Inside the pantry wasn't much better, small and with no lighting, it would make finding anything an interesting feat. We knew the wee pantry was not going to work for our needs so Paul went to work building a wall for a new pantry. But with any building project you have to re-adjust your existing space to make space and so we chose to eliminate the eat in portion of the kitchen. It wasn't too hard a decision for me as it was one of those things that I didn't like about my last house, but didn't have much option to rectify as I had no dining room. This house has a good sized dining room so it was obvious to both of us which direction we wanted to go in. I now have a pantry door that is a standard 36 inch width. The inside is even more exciting with ample storage shelves for food and all those other kitcheny things that don't fit in cupboards, including my deep freeze (I was siting on it taking the next picture). of room for everything. It was such a pleasure to finally unpack our kitchen boxes and a nice feeling to have at least one room, even a pantry, completed in this long moving process. Happy Day to you! 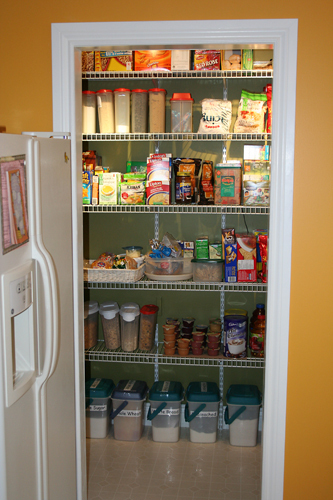 lovely pantry! a walk in closet in your kitchen woot! Phin is still sick sorry we missed you at G&S. can i live in your pantry? Oh Sarah, I love my pantry so much!! 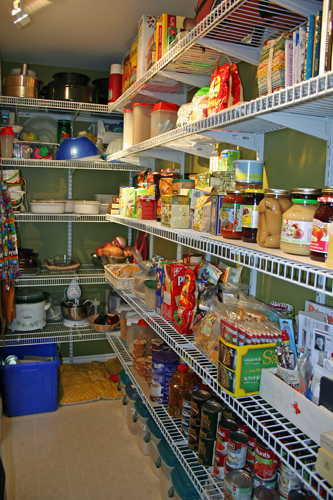 It hides all those things that never fit into cupboards and finding things is so much easier. I had to let go of the big eat-in portion of my kitchen to make it work, but it was so worth it! I still have a kitchen island for breakfast/lunch meals. tired of looking at my last post?